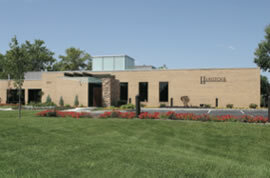 Hamilton's on Westown Parkway is our newest facility, completed in the summer of 2005. Noted for its beautiful rich interior with two stone fireplaces and plenty of natural light from the expansive windows, this unique location boasts several outdoor gardens which can be utilized by family and friends for memorial gatherings as well. The Fireside Reception Room, overlooking the west garden, is available to serve refreshments or a catered meal for family and friends. A buffet serving island and several counters offer convenience for both large and small groups, with the availability of a full kitchen nearby. This area of Hamilton’s can also be used – schedule permitting – by breakfast clubs and other community groups for meetings and programs. Hamilton’s on Westown Parkway is also the current location of Hamilton’s Academy of Grief & Loss’ expansive Grief Resource Library. In addition, if you are in need of a memorial keepsake or sympathy gift, be sure to stop in and visit our beautiful Memorial Gift Shop!